Homemade calzones are easy to make at home and you will love these veggie calzones! They are stuffed with kale, mushrooms, and ricotta cheese. Serve marinara sauce on the side for dipping! 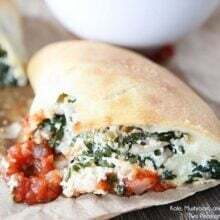 This calzone recipe is a dinner winner! I always ask Josh what he wants for dinner. I really don’t know why I ask for his input because we rarely make what he wants. Don’t feel bad for Josh because he eats well:) I just don’t want to make for dinner every night. Josh always suggests pizza. He never gets tired of pizza. Last week when Josh asked for pizza, I compromised and suggested calzones. Josh loved the idea. He asked what kind of calzones and I told him Kale, Mushroom, and Ricotta Calzones. I could see the look of disappointment in his face when I didn’t mention sausage or pepperoni. I told Josh to cheer up because these meatless calzones were going to be incredibly tasty and I was right! Even Josh didn’t miss the meat! You can make homemade pizza dough or you can use store bought dough for this recipe. If we are feeling lazy, we buy Trader Joe’s or Whole Foods pizza dough. Their refrigerated pizza doughs are excellent! Once you have your dough, you can get started on the filling. I am on a kale kick and can’t get enough. I cooked the kale with onion, garlic, and tossed in some mushrooms. Next, I stirred together ricotta, mozzarella, and parmesan cheese. A trio of cheese, please! I added in a little crushed red pepper, dried basil, salt, and pepper. I added in the kale and mushroom mixture and our filling was ready to go! Josh rolled out the pizza dough into circles and we filled our calzones with the kale, mushroom, and ricotta filling. We folded the dough over the filling, pinched the edges, and brushed them generously with olive oil. Into the oven they went and 20 minutes later, our calzones were golden brown and ready to be devoured. We served our calzones with our Easy Marinara Sauce. Our Slow Cooker Marinara Sauce would also be good with the calzones! We had fun dipping and dunking our calzones! 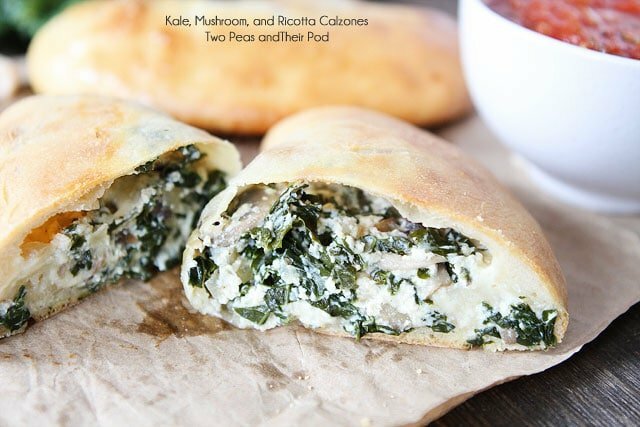 Kale, Mushroom, and Ricotta Calzones are perfect for Meatless Monday…or any night. Josh already asked if we could have these calzones for dinner again and I think I will have to say yes! If you like this calzone recipe, give these pizza recipes a try! 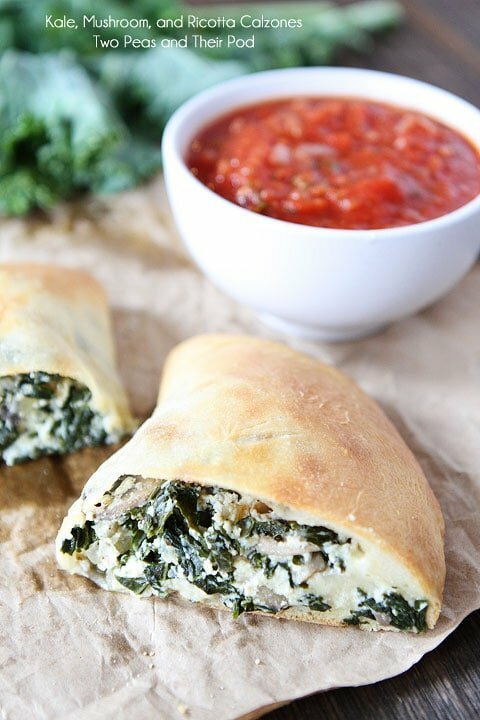 Calzones filled with kale, mushrooms, ricotta, mozzarella, and parmesan cheese. Serve our Easy Marinara Sauce on the side. These calzones are fun to dip and delicious to eat! 1. Preheat the oven to 400 degrees F. Make sure your pizza dough is at room temperature. Set aside. 2. To make the calzone filling, in a large skillet, heat the olive oil over medium heat. Add the onion and cook, until translucent, about 3-4 minutes. Stir in the garlic and cook for 1 minute. Add the kale and mushrooms, cover and cook until tender, about 3-4 minutes. Remove from heat and set aside. 3. In a large bowl, combine the ricotta, mozzarella, and Parmesan cheeses. Stir in the kale and mushroom mixture. Add the dried basil, crushed red pepper, and season with salt and pepper. 4. Divide the pizza dough into 4 equal portions, and shape each portion into a ball. Lightly flour your work space. Start with 1 ball and roll it out into a circle, about 7 inches in diameter. Brush the edges of the round lightly with water. Place about a 1/2 cup of the kale cheese mixture on half of the round, leaving a 1-inch border. Gently fold the dough over so the edges meet and pinch the dough together with your fingers. Pierce the top of the calzone with the fork and carefully transfer to a baking sheet. Repeat with the remaining dough and filling. Brush each calzone with olive oil. 5. Place the calzones in the oven and bake for 18-20 minutes, or until golden brown. Let the calzones cool for about 5 minutes. Serve warm. Note-I like to use Trader Joe's Kale that is already chopped. Great time saver! And if you don't want to make pizza dough from scratch, we love Trader Joe's and Whole Foods refrigerated pizza dough. Yum! Healthy and delicious calzones! My stomach is growling! Awesome recipe!! Amazing! Calzones are always so good and I love your Kale filling!! These look fantastic! 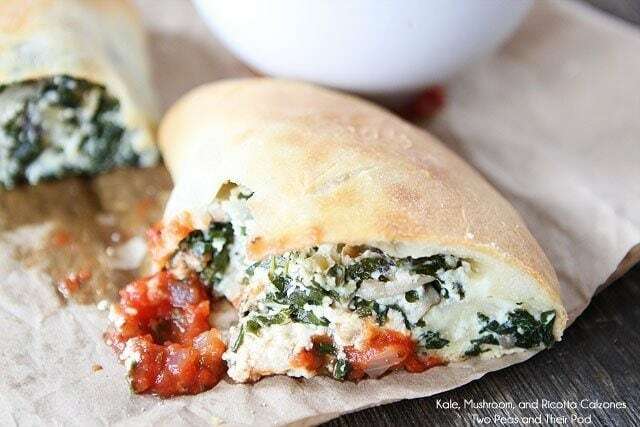 I am on a kale kick lately too so these calzones look perfect! Thanks for sharing Maria 🙂 Yum! Josh sounds like my husband. If given the choice, he’d eat pizza every night for dinner. I would love these calzones! OK, I want these for breakfast! Love ricotta on pizza and in calzone sounds even better. I love these Maria… and I wouldn’t miss the meat either! Ooo, I’d gladly take one of these for breakfast! Mmm! This is being pinned! We will be harvesting kale soon and this is a great way to use it! These sound fantastic! We don’t eat a lot of kale in the winter, but we plant it and enjoy it ALL summer. Can’t wait to try these! Thanks, Maria. These calzones look great Maria! Slayed. Done. Death became me. The end. Prettiest calzones ever! Sounds delicious! The best looking calzones I’ve ever seen! Love the sound of the filling! Pinning! These look so good! I don’t even think my hubby would realize that the meat was “missing” if I made these! I think these would be PERFECT with cottage cheese substituted for the ricotta (it’s too “grainy” textured for me) & alfredo sauce instead of the marinara! Mmmm…. I really need to action calzones more often, especially if kale is involved! Gorgeous! When we don’t know what to fix for dinner its usually pizza or breakfast. These look so good, love the filling! Thanks so much for posting this recipe! I picked up extra organic kale at the winter farmer’s market on Saturday, hoping to ‘copycat’ a delicious flatbread that I had enjoyed recently, which had the same ingredients as your calzones. I’m sure that, when I take these out of the oven for dinner tonight, they’ll be delicious! And suddenly, all I want for lunch is a cheesy, veggie, peppery calzone. 🙂 These look so good Maria. I’ve never made my own calzones before. Usually rely on the pizza shop to do it. I can only imagine how good these would taste. I love kale on my pizza when I make it at home! No need for meat in this baby! Yum! I made cheesy kale calzones not too long ago and they were great! Now I just need to add mushrooms to the mix! These look so hearty and wonderful! Can’t wait to try them! Wow! That is totally what I am craving! Do you ever have that? Where you don’t know what you want for dinner, but then you see it and you are like THAT’S IT!! Gina just walked by and saw this picture and said – Oh my gosh mommy can you make that PLEEEEEASE?! Ok, I will 🙂 This seriously looks amazing. It reminds me of the spinach calzones my dad used to make at his restaurant. I’m dying for one right of these right now! My husband would be disappointed with meatless calzones too, though I still don’t think I could convince him with veggies! This looks fantastic! I never get tired of pizza either!… How do you get your calzones to be so thin, the crust I mean. Mine end up being a big pile of doughy mess! Roll them out on a well floured surface before filling them. That’s it, our next homemade pizza night is officially changed to calzone night! This looks soooo good! These look absolutely amazing! I’d LOVE one right now! I want this for dinner too!! These calzones look so yummy! A great way to get my kids to eat greens is to pair them with cheese, and with triple cheese? You can’t go wrong. Perhaps even some kale in the dough . . . for a double triple? These look delicious! I love Calzones especially when they are fully loaded like this. I’m always let down when I bite into one without a lot of filling :). Those calzones look really good! I am liking the mushrooms and kale combo in them! This looks awesome! We eat a lot of spinach pies here in New England….Kale is such an excellent substitute! 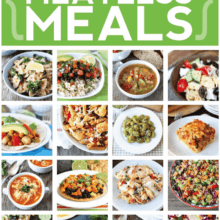 I have been looking for new ideas for some dairy meals for next week. You have provided the makings of a meal. Thanks. I’ve never thought to make calzones at home, you have the best ideas! This is def going on our menu for next week! Do these freeze/reheat well? I’ve been wanting to make these and I’ve been looking for good freezer recipes to make because I’m about 6 1/2 months preggers and want to stock up on healthy meals I can make up quickly after the baby’s born. Just made this for lunch and it was so easy and so delicious! I’m excited to serve this to future company. 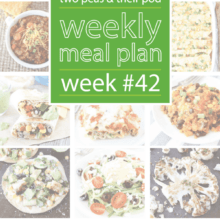 Pingback: Recipes of the Week | the BLOG. Oh my gosh, I made these again, they are so rewarding! – Easy and super tasty! I refrigerated 1/2 and baked them next day; they turned out pretty much the same: Super tasty! How did you keep your filling so white? Ours got tan from the mushrooms and onions; did we maybe cook them too long? Just wondering if anyone tried freezing these and cooking from frozen? I wouldn’t mind making a bunch and freezing them for those lazy days. We haven’t, but I am sure it would work! Made them for supper last night. Delicious! I made these for dinner a couple nights ago, and my husband, son, and I all loved them! My son LOVED being able to dip them in the pasta sauce! These were very flavorful and even the leftovers were good (even though they’re not as crispy when you get them out of fridge). I used the pillsbury classic pizza crust dough because I was feeling lazy 🙂 I added in a little spinach that I was needing to use up before it went bad. Also, I left out the red pepper flakes. Everything else was made as written. GREAT RECIPE! 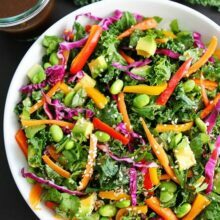 Why is there a vegetarian recipe on a vegan blog? second time in three days making these. have had a bunch of fun substituting kale and mushrooms for virtually any other veggie we can get our hands on. thanks for sharing!